The Ilford advertisement in the 1959 summer edition of 'Colour Photography' magazine still shows the previous Style 2 Sportsman model; the new Style 3 Sportsman being first shown in the November/December 1959 issue. Although only the f2.8 Vario model is shown in that advertisement, the text clearly indicates the intention, for the first time, to promote a range of models. "A wonderful range of cameras! Every one of them will give brilliant colour shots and superb black-and-whites." "See them at your dealers and make your own choice". Amateur Photographer magazine for 16th December 1959 (in Talking Shop by Charles Johnson, p670) also describes the announcement by Ilford Ltd of the introduction of "three new models of their Sportsman camera". The report reads that, since the launch of the original model (reviewed in AP for 10th July 1957) "... has established considerable popularity in the lowest price 35mm range." "We have not yet had the opportunity of testing the larger aperture lens (now f2.8 instead of f3.5), but this should be quite satisfactory, as there appears to have been a pronounced improvement in the last few years in the performance of f2.8 lenses compared with their corresponding f3.5 versions." The depth of the top cap has again been restyled; although it is the same overall height as for Style 2 (increased in comparison to the 1957 original) the profile has been 'smoothed' across its top surface and the lever wind is now recessed beneath the top cap. The exposure counter remains on the top plate and there is still a knurled rewind knob. The viewfinder is described as 'direct vision with luminous guidelines'. AP described how the "new high-contrast viewfinder has a brightline frame and parallax compensation marks." In late 1959 the 'base' model retained the 3-element f3.5 Dignar 45mm anastigmat lens in a 3-speed Vario shutter, still priced at £11.11s.11d = £11.60p, but there is also a f2.8 45mm Dignar model, priced at £11.19s.6d = £11.98p. A leather ever ready case is priced at £2.3s.7d = £2.18p or a de-luxe case costs £3.5s.1d = £3.25p. By early 1960 Ilford adverts no longer mention the f3.5 model. It seems the Style 3 f3.5 model was quite short lived and remnant stock was subsequently sold at a discount. 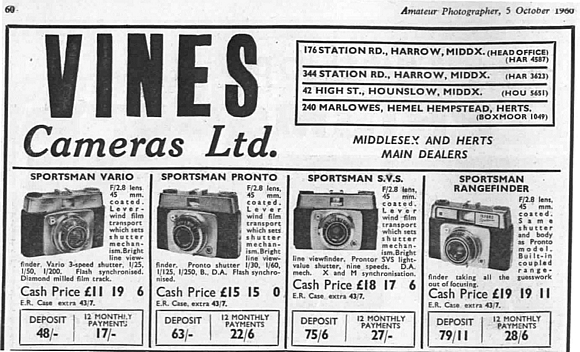 In a 'small ad' at the back of Amateur Photographer magazine for 12th October 1960, a company called F.E.Jones of Liverpool are advertising a 'Bright Line' viewfinder Sportsman with f3.5 lens at the discount price of £7.17s.6d (£7.88p) stating 'Limited Quantity'. 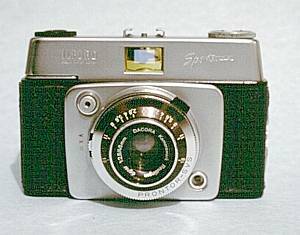 In the January/February 1960 issue of 'Colour Photography' magazine the Style 3 range is described, including a Rangefinder model. This latter camera is the most expensive Sportsman within the Style 3 range, priced at £19.19s.11d (near £20) with a 4-speed Pronto shutter and its rangefinder fully coupled to the f2.8 Dignar lens. 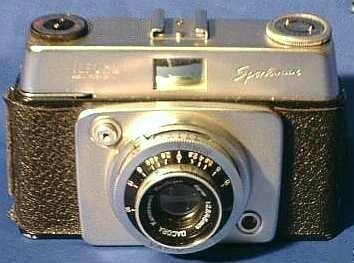 But it is almost certain that a true Style 3 Sportsman Rangefinder never existed. The Style 4's top cap was intentionally designed to accomodate a second (i.e. the rangefinder) window, as there is no facility for fitting such a window into the Style 3's top cap. Thus, it is believed that the announcement of a Sportsman Rangefinder was, effectively and necessarily, the introduction of the Style 4 top cap. As discussed on my Style 4 web page, the Style 4 top cap was subsequently (around late spring 1962) applied to all the (previously Style 3) 'base' models. The advert alongside illustrates how the Style 3 Vario, Pronto and Prontor SVS models co-existed with the Style 4 Rangefinder in October 1960, long after the Style 4 Rangefinder was first advertised in Spring 1960. It is currently unknown when exactly the Style 3's top cap was redesigned to 'match' the Style 4 Rangefinder, but adverts indicate this took place maybe late Spring 1962, when the Style 4 range was extended to include the Sportsman Auto, Auto Rangefinder and Manumatic. The Sportsman Pronto, priced at £15.15s.0d = £15.75p, is fitted with a 4-speed Pronto shutter. The Sportsman with Prontor SVS (1s to 1/300th) is priced at £18.17s.6d = £18.88p. The speed range of the Prontor SVS is known to have been increased to 1/500th at sometime prior to Spring 1962 when it was redesigned to Style 4. An Ilford Sportslite capacitor-type capless bulb flashgun, with collapsible reflector, is also advertised with the autumn 1959 Sportsman range. 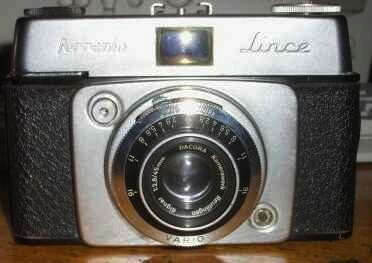 A Ferrania Lince, looking very much like a Sportsman Style 3 with vario shutter. Dave Durnford originally told me of the existence of Dacora's badged Ferrania and then Andy Holliman found this example on the Italian e-bay site. Dave Durnford has suggested that similar Dacoras were rebadged by the Spanish Certex company. Also, see the AMC on my Style 4 page and the Hanimex Electra on the Sportsmaster page.